Important Note: If you have a manhole on your front lawn it is likely that your meter is located inside a pit. Customers are urged not to try and open the pit cover. It is most likely locked and should only be opened by a District employee. If you have this type of arrangement please call the District at (516)931-6469. We will be more than happy to access and read your meter. Check your meter and write down the numbers. When reading your meter, include all the numbers on the meter, including all zeros. See “A” in the picture. Save the numbers for the next time you check your meter. 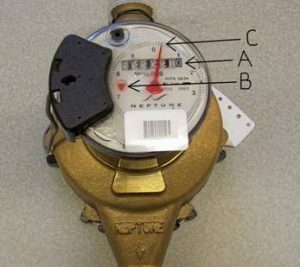 When you check your meter again, repeat the process described above and subtract the new number from the previous number. This number is the amount of water used in gallons.